Akhand Jyoti of Merhada Mata to be lit the occasion of Ist Navratra on September 19. A view of Merhada Mata, Udhampur. Udhampur, September 11 - As usual, the Akhand Jyoti of Merhada Mata would be lit at village Ghordi and village Barmeen on the occasion of Ist Navratra on September 19th, 2009. As per the President, Merhada Mata Management Committee, Ghordi, Mr. Bharat Bhushan Sharma, the Akhand Jyoti of Merhada Mata would remain at village Ghordi on 19th September, 2009 for public darshan and shall be carried to Merhada early in the morning of 20th September, 2009 on the occasion of 2nd Navratra followed by a colourful procession chanting bhajan & kirtan. 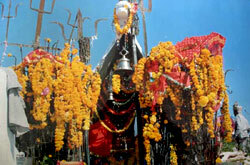 The temple is situated about 15 kms away from village Ghordi in Ramnagar tehsil of the Udhampur district on the top of a hillock and is also a very good tourist spot where thousands of tourists and devotees of Merhada Mata visits through out the year. The people from all walks of life irrespective of caste, creed, colour and religion from all parts of Ramnagar, Chenani and some parts of Udhampur areas visit this sacred place with great faith and devotion to seek blessings of Merhada Mata. Another sacred place of Ganpati, Pathera Mata and Sheetla Mata Kotla are also the most popular places of worship around the temple of Merhada Mata which are also gaining the attraction of thousands of devotees. The Management Committee of Merhada Mata has already made elaborate arrangements of comfortable stay of the devotees and free langer for the 2nd Navratra besides some other social organisation would also arrange free pandals for the visiting devotees at Nalla Ghouran, Bakhater, Sheetla Mata temple Kotla, Ganpati, Galua and Merhada Mata site. Adequate arrangements of security, drinking water and power supply are being made by the administration during the Navratra days. www.jammu.com is a leading website on Jammu, Kashmir & Ladakh.